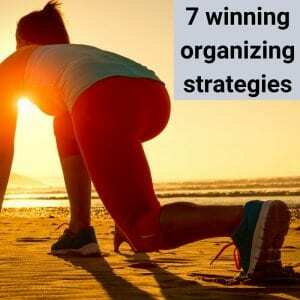 This week I’m sharing more of my top strategies to help you go from overwhelmed to organized. 1. Use containers while de-cluttering instead of creating piles. You’ll need these clearly labeled containers next to the area you are de-cluttering: donate, sell, trash, recycle, items to keep but go elsewhere and shred. 2. Find a home for everything you decide to keep. If you can’t decide where to keep it, these two questions should help 1. Where will you look for it? 2. Where will you use it? Immediately return things to their homes after you’ve used them. 3. Place a laundry basket in every bedroom. No more piles of dirty clothing or wondering if that shirt is clean or dirty. A stain remover near the basket will come in handy also. 4. Start de-cluttering in mini sessions. You don’t have to set aside hours to make a difference. Find 10 things to discard in your home today (donate, toss, recycle, or sell). 5. Dedicate 15 minutes a day to tidying up. Keeping up during the week is less challenging than playing catch-up on weekends. 6. Resist shopping for fun. This tends to lead to impulse purchases of things we don’t need. Consider shopping for things on a charitable organization’s wish list, not things for your home. Do not enter the thrift store when you’re dropping off your donations if it usually leads to impulse buying. 7. Think twice before buying new things. Ask yourself where you will put it, do you have room for it and do you really need it? Don’t leave new things in their bags, you’ll forget you have them. Put them away immediately after returning home.